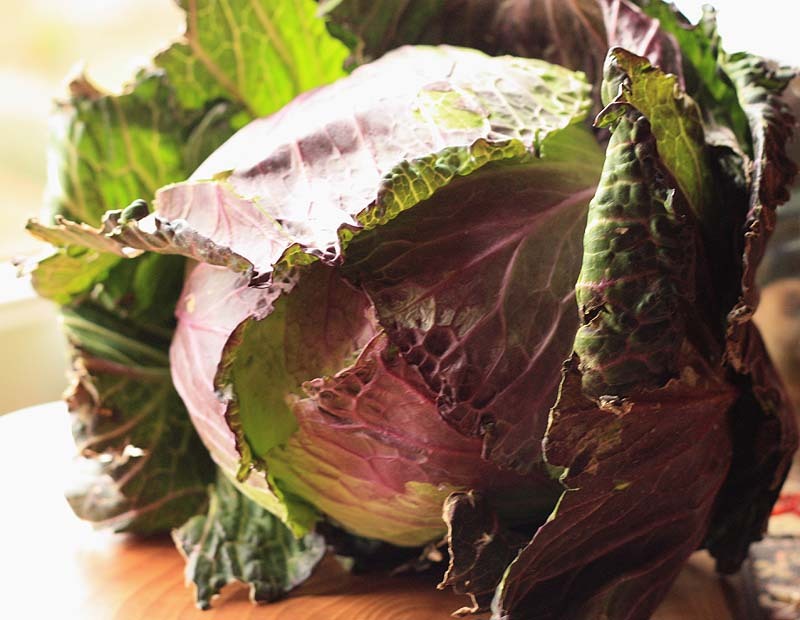 The January King cabbage is a magnificent vegetable and worthy of its royal title. The outer leaves of the heart are lightly crinkled and coloured in a purple-red hue that is just so glorious to the eyes. It kind of reminds me of a crown. I actually found it really hard and heart breaking (well almost) cutting into this king of cabbages, but it had to be done. As admiring it in the vegetable rack was not going to stop my belly from rumbling. It was time for it to go into the cooking pot and feed me and my husband. In the past and due to my naivety, I used to believe that January King was so called because it only grew in January, but of course that was not the case. Later I learned this cabbage earned its name because of its ability to remain hardy and hearty in cold environments. Its certainly a good variety to grow in Scotland (this one came from Fife) as not even severe frost seems to bother its leaves that look deceptively fragile. 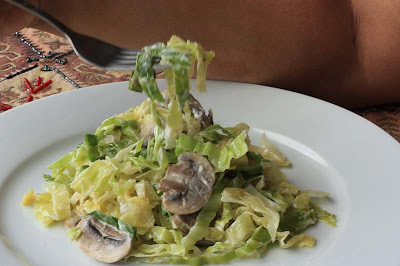 In this recipe the cabbage is treated like tagliatelle and served with a creamy sauce with garlic and herbs. Unfortunately the beautiful purple tinge disappeared on cooking, but the cabbage itself was crisp, crunchy and flavourful. Shred the cabbage into fine, long strips, like tagliatelle. Cook in boiling water, about four minutes or until done. Fry the mushrooms in the oil for about five minutes, until tender. Drain the cabbage and add to the pan wit the mushrooms. Stir in the Boursin and add to the pan with the mushrooms. Stir in the Boursin and a little salt and freshly ground black pepper to taste. Serve immediately with some potatoes. 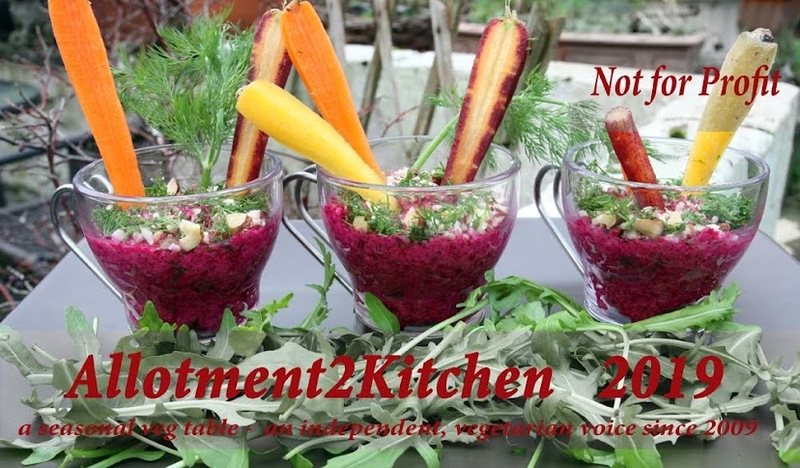 Recipe adapted from Rose Elliots Low Carb Vegetarian Diet. A lovely cabbage - I don't think we have that variety over here. 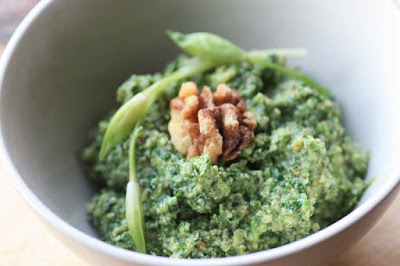 Nice idea to use it like pasta as a base for a sauce. I understand what you mean about not wanting to cut into it...I'm that way with pretty vegetables too. 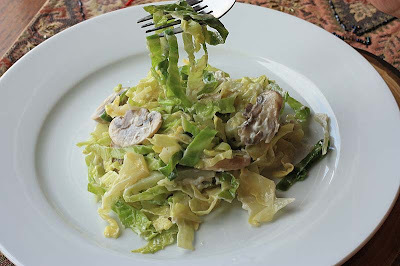 Cabbage tagliatelle is very clever; this dish sounds great...a wonderful new way (for me anyway)to enjoy cabbage; I'll be trying something similar soon! Nummy! I look forward to trying this. A very nice and simple salad.Looks delicious. Do you think any cabbage would be suitable? 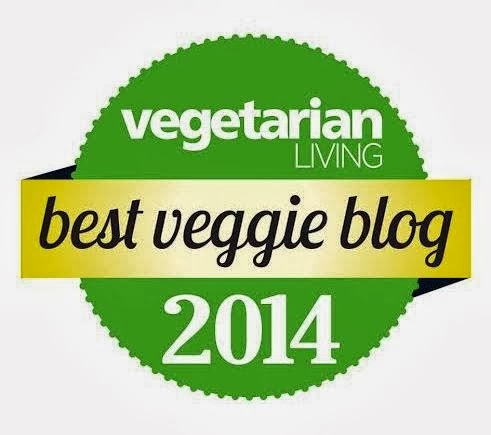 I love cabbage, and it's one veg which all the family will eat without any complaints. Sadly, I didn't manage to grow any last year as the slugs got there first. Every one of my cabbages resembled a lace doily, they had that many holes in them. This recipe sounds delicious, I love mushrooms too. Hi finally I'm just catching up on everyone's blogs that I follow. I have seen versions of this before, thanks for highlighting it again, it looks ever so tasty. Did you grow this? It is amazing! Savoy cabbage would work well too. The cabbage tagliatelle is quite an old idea really, but a neat one as the cabbage is the star of the dish. I think Sweetheart cabbage and savoy cabbage would work well, but the others may just be too 'shreddy' rather than long strips that are meant to duplicate tagliatelle. I hope you successfully grow some this year and that the slugs don't leave you futher compostable lace doilies. I grew lots of cabbages last year and although munched here and there by slugs, overall they were not too bad. But I've never grown January King cabbage. I would like to one-day when I have more space. I certainly think black pepper boursin would work well too, just add a different flavour from the garlic and herbs. Try it. Aww HayMarket8. I am so flattered that you think I grew this magnificent vegetable, but unfortunately not. Maybe one!